Béla Tarr has arrived in Minneapolis. In the brief conversations I’ve had with him, it’s immediately apparent that the dialogue will prove to be insightful, interesting, and likely funny. A visit to the US is quite exceptional for him as he rarely allows himself to be pried away from his work, and I can’t urge you enough to take advantage of an opportunity to hear him speak about his work. Even if you are not entirely familiar with his films, the even will prove to be an excellent introduction to the lauded director, his style, and his work. 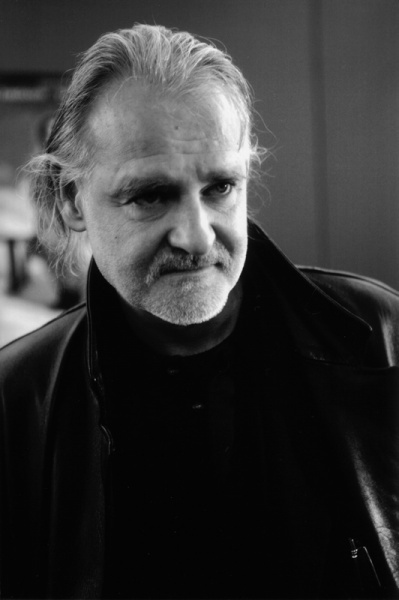 The folks over at Bomb magazine published an interview with Béla Tarr in their summer issue. It focuses a great deal on his latest work, The Man From London, which will make it’s Midwest premiere here at the Walker on october 20, but delves into what drives his filmmaking in general. If you would like to win two free tickets to the Regis Dialogue with Béla Tarr, email your answer to the following question to: joe [dot] beres [at] walkeart [dot] org. The first three people with the correct answer will win the tickets. *hint, the answer can be found in Bomb.